By Leonieke van Dipten, 25/09/2017 at 7:00 am . 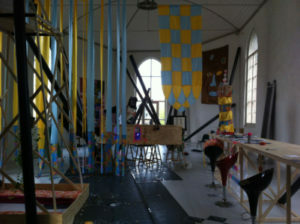 Tim and Katrein Breukers are artists in residence in Hotel Maria Kapel in the little Dutch town Hoorn. For a period of three months they have been researching the work of the musician and good friend of their grandmother’s, Julian B. Coco (1924-2013), trying to find a connection between his work and person and the place of residency. They brought locals in contact with the music of Julian B. Coco and organized an exposition, which reflected those colorful and jaunty meetings. The ‘Tribute to Julian B. Coco’ subsequently was the subject of the digital tool Debate Online, with which the Domain for Art Criticism aimed to give everybody involved in the exposition – including the artists themselves – a voice in the reflection on the work. Two critics involved with Domain for Art Criticism, Manus Groenen and Daphne Rieken, followed the working process and wrote a report which is a mix of documentation, critical review and theoretical analysis. The voice of everyone joining in the debate could become part of their report.